She passed away at 4pm Monday, September 3, 2007. Rockabilly artist, Janis Martin had been diagnosed with terminal cancer and it had spread all over her body. Her husband Wayne Whitt has said that she was napping most of the day in a hospital bed at her home in Danville, VA.
Janis had been suffering from severe headaches over the past several months so she found it necessary to cancel her recent booking at the Americana Festival in England. The headaches turned out to be stress related from all the grief she had to endure from losing her son Kevin who passed away in January of this year. Recently when a large tumor appeared on her shoulder, Janis and Wayne headed back to the doctors for tests. The tests revealed that she has a very aggressive type of cancer and spreaded all over her body. At age 11, she began her career as a member of the WDVA Barndance in Danville, Virginia. This same show launched the careers of the famous Louvin Brothers, Charlie and Ira. From the barndance, she traveled with Glen Thompson's band for two years and then went on the road with Jim Eanes, a former Starday recording artist. 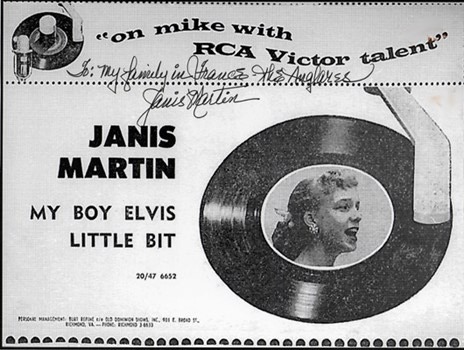 In 1953, she appeared at a Tobacco Festival with Ernest Tubb and Sunshine Sue. As a result of this appearance, Janis was invited to become a regular member of the Old Dominion Barndance in Richmond, Virginia. At that time, this stageshow was the third largest in the nation, ranking only behind the Grand Old Opry and The Wheeling, West Virginia Barndance. Such stars as Jean Shepherd, Hawkshaw Hawkins, Sonny James, Martha Carson, the renowned Carter Sisters and others appeared on this show and encouraged Janis to try for the "big time". Two years of travels with this show gave her the experience in show business that she would need later in life. She was noted for her dynamic stage appearance and was happiest while on stage, whether in a theater or tent show, Janis lived for one thing - entertaining people. Two staff announcers at WRVA (the station that carried the barndance over the CBS network) were successful songwriters. They wrote the hit "Little Things Mean A Lot". When the fifties exploded with rock or rockabilly music, they wrote a song called "Will you, Will yum". They asked Janis to sing it on the barndance for audience reaction, and they cut a demo tape of it to send to their publisher in New York. When the demo tape arrived at Tannen Music in New York, the publisher not only accepted the song but rushed over to Steve Sholes of RCA Victor, so he could hear it. Sholes wanted to know who the vocalist was on the tape and called Richmond to find out. Janis was contacted and invited to Nashville to record the song on Victor Records. So, at the age of fifteen, she became a recording artist. This record was her biggest hit and on the flip side of the record was a song called "Drugstore Rock And Roll" that Janis wrote herself. This record sold about 750.000 copies and she became in constant demand for appearances all over the US. Janis went on to appear on the Tonight Show, American Bandstand, and Ozark Jubilee with Red Foley which featured Brenda Lee before Brenda began her recording career. Janis traveled all over the nation, making appearances on TV, radio and stage. She did her first road tour with Hank Snow and went on other tours with Faron Young, Porter Waggoner, Jim Edward Maxine and Bonnie Brown, Johnny Cash, Del Wood and Carl Perkins. 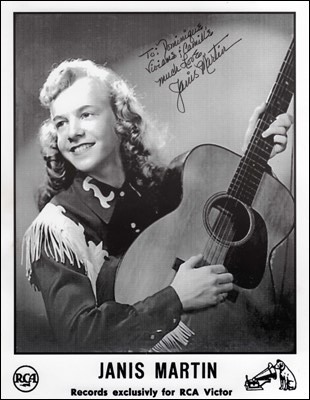 She was chosen by RCA to become a regular member of the Jim Reeves show and traveled with him exclusively. In 1957, this package show went overseas to entertain the armed forces in Europe. On returning to the States, Janis was selected from the package to appear on the Today Show with Dave Garroway to tell of their experiences and to sing her latest record, "My Boy Elvis". After this show, she was invited to appear an the biggest one of all - the Grand Old Opry. Janis was voted the 'Most Promising Female Artist of 1956" at the annual disc jockey convention and received the Billboard Magazine award on plaque. With much success behind her, she formed her own band called the "Marteens" and began her travels in the U.S. and Canada, playing clubs and fairs. She made a screen test for MGM, but Janis had married her childhood sweetheart at the age of 15 and in 1958 she gave birth to a son and temporarily laid her career aside, although she continued recording and appearances into 1959. When her son was two years old, she signed with Palette Records and recorded four sides with them, but her marriage and family interfered with her career to the point that she decided to retire and just be a wife and mother. Since 1960, she has kept in "musical shape" by making appearances on a local basis. A while she formed another band and began statewide appearances. 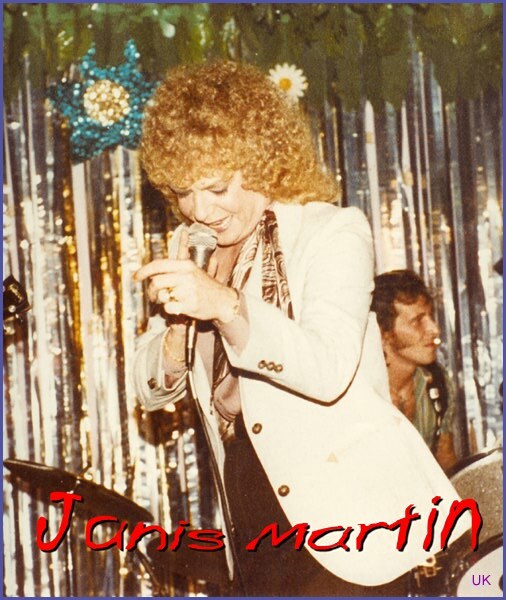 Janis' band was known as "Janis Martin & The Variations", She carries saxophone, rhythm guitar, organ, herself on electric lead guitar, and her son on drums. They have a wide variety of music to offer, from country to big band songs.